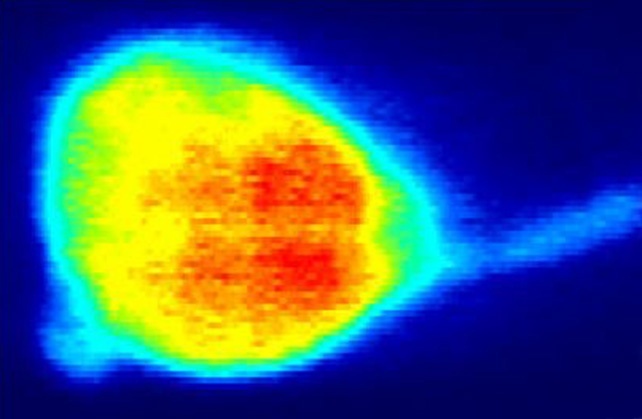 Streak-FLIM (Fluorescence Lifetime Imaging Microscopy) is a unique technique developed by the FRAIB imaging platform, which makes it possible to reveal protein-protein and protein-DNA interactions, or changes in spatial conformation. If they are close enough to interact, molecules transfer energy to each other and this can be measured through fluorescence lifetime, providing a wealth of useful information. These measures are nevertheless independent of the concentration of the molecule and its fluorescence intensity. Detection of molecular interactions (protein – protein, protein – DNA, etc.) by measuring the fluorescence lifetime of the donor in the absence or presence of an acceptor. Detection by a Streak camera (Hamamatsu Streakscope) for measuring the lifetime, with a resolution on the order of a picosecond. Variable time acquisition (from seconds to tens of seconds) according to the fluorescence intensity and the type of information sought (lifetime by ROI, or pixel-based). Images in x, t (t in variable full scale according to the voltage ramp applied to the deflection electrodes from 1 ns to 1 µs). Images in x, t with stacks of images in y. Obtaining the fluorescence decay curves for one ROI or per pixel. Determining the ai and ti parameters by least squares adjustment of the obtained experimental curves (nonlinear least squares or maximum likelihood). Tsunami Spectra Physics infrared laser, femtosecond tunable with excitation between 700-1000 nm. Pulse selector for adapting the pulse frequency to the sensor operating frequency. 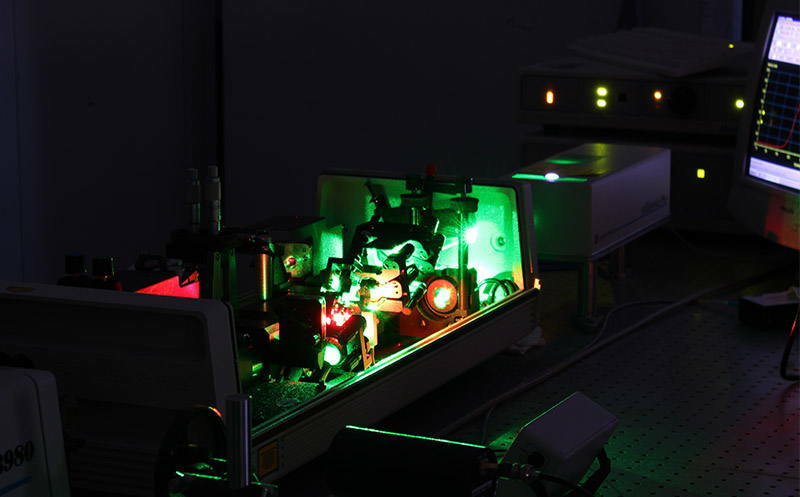 Picosecond pulsed diode laser, 403 nm (for DAPI one-photon excitation). Picosecond pulsed diode laser, 445 nm (for CFP one-photon excitation). Picosecond pulsed diode laser 442nm. Picosecond pulsed diode laser 464nm. “Taupography” is made by FRAIB imagery platform and LRSV lab. This software is under the licence of Photonics, so please contact Thomas Gelot or Eric Dréan. Daniel Marino, Solène Froidure, Joanne Canonne, Sara Ben Khaled, Mehdi Khafif, Cécile Pouzet, Alain Jauneau, Dominique Roby, Susana Rivas. Arabidopsis ubiquitin ligase MIEL1 mediates degradation of the transcription factor MYB30 weakening plant defence. Nature Communications, 2013, 4: 1476 . Céline Courilleau, Catherine Chailleux, Alain Jauneau, Fanny Grimal, Sébastien Briois, Elisa Boutet-Robinet, François Boudsocq, Didier Trouche, and Yvan Canitrot. The chromatin remodeler p400 ATPase facilitates Rad51-mediated repair of DNA double-strand breaks J Cell Biol, 2012 199:1067-1081. Joanne Canonne, Daniel Marino, Alain Jauneau, Cecile Pouzet, Christian Brière, Dominique Roby and Susana Rivas. The Xanthomonas Type III Effector XopD Targets the Arabidopsis Transcription Factor MYB30 to Suppress Plant Defense. Plant Cell, 2011. Katharina Heidrich, Lennart Wirthmueller, Céline Tasset, Cécile Pouzet, Laurent Deslandes and Jane E. Parker. Arabidopsis EDS1 connects pathogen effector recognition to cell compartment specific immune responses. Science 2011. Rose Boutros, Corinne Lorenzo, Odile Mondesert, Alain Jauneau, Vanessa Oakes, Christine Dozier, Brian Gabrielli, Bernard Ducommun. CDC25B associates with a centrin 2-containing complex and is involved in maintaining centrosome integrity.Biol Cell., 2011. Céline Tasset, Maud Bernoux, Alain Jauneau, Cécile Pouzet, Christian Brière, Sylvie Kieffer-Jacquino, Yves Marco and Laurent Deslandes. The Ralstonia solanacearum effector PopP2 autoacetylates on a lysine residue that is required to trigger plant immune response. PlosPathogens. 2010. Alexandre Perochon, Stefan Dieterle, Cecile Pouzet, Didier Aldon, Jean-Philippe Galaud, Benoit, Ranty. Interaction of a plant pseudo-response regulator with a calmodulin-like protein. BBRC 2010. Bernoux M, Timmers T, Jauneau A, Brière C, de Wit PJ, Marco Y, Deslandes L. RD19, an Arabidopsis Cysteine Protease Required for RRS1-R-Mediated Resistance, Is Relocalized to the Nucleus by the Ralstonia solanacearum PopP2 Effector. Plant Cell., 2008. 20: 2252-2264.